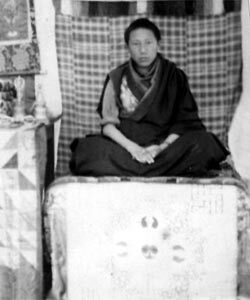 The First Kyabje Dorzong Rinpoche, Konchok Gyalpo was a Meditation Master as well as an outstanding scholar in philosophy the sutras and tantras. He was deeply learned in the Tibetan sciences and poetry. He traveled widely, having journeyed as far as Swat, taking in the pilgrimage places of central and North India, Sikkim and Nepal, where many spontaneous miracles marked his passing by. Once near Patna, he was waylaid by robbers who assumed every pilgrim from Tibet was carrying gold to make offerings. When they tried to decapitate him the swords heavy blade bounced off his neck; and when they searched him they discovered he was a mendicant pilgrim with no possessions. When he came back from India, at the request of His Holiness Sakya Dagchen Amen, he wrote down an account of his travels, which was of great interest to later Tibetan scholars. He was advised by his teacher The First Kyabje Drukpa Yongdzin Rinpoche Lhatsewa Ngawang Zangpo to go into China where he would be of great benefit to many people and would establish long-lasting connections. On his way to China, while passing through Kham, Western Tibet, Konchok Gyalpo and his companions were waylaid by nine bandits called Rekhe Chisoh. They set about trying to kill the lama and rob the group, but the lama displayed some miracles. When they stabbed him with a knife it went through his body, like a rainbow. And when they flung him from a high cliff, the fast-flowing river below swept him back onto the cliffs edge where he sat quietly in meditation. After witnessing this phenomena twice, the bandits were overwhelmed with devotion for him and requested him to go to Rongmi with them and settle in the region. He replied that he had to leave for China on his lamas instructions. As well as making persisting entreaties, the bandit converts threatened to commit suicide if Konchok Gyalpo deserted them. Believing they would carry out their threat, which would be a heavy sin for him, he reluctantly went on to Rongmi. This became an obstacle to his successful path in helping people in China, according to his lamas instructions. At a place called Dorje Dzong (the Vajra Fort) in Rongmi district, he established his monastery at the request of local inhabitants. There he spent the rest of his life in meditation, teaching and practising. 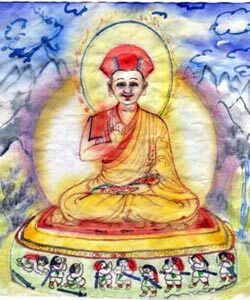 His eight chief disciples established eight branch monasteries in his lifetime. The name of the Dorzong Rinpoche's and the monastery were taken from the name of this region. For their manifestation of compassion, realization and nobility, the successive reincarnations of Kyabje Dorzong Rinpoche were like a precious rosary of pearls because each one had the same perfect qualities as the others. They held the teachings of realization as the sun holds its brilliance, without any stains. From that day up to the present there have been many excellent disciples who were highly realized masters, through whom innumerable Drukpa Kagyu practitioners, in Rongmi and Gon Jo regions of Kham, Tibet, became ripened and realized. Khamtrul Rinpoche and Kyabje Dorzong Rinpoche were popularly known as the sun and moon among the stars, referring to the other Drukpa Kagyu lamas of Kham.